Egypt declares war on Hamas but who is the oppressor and who is the oppressed? The Egyptian intelligence agencies know each one of the people of the Gaza Strip, whether they are inside or outside the Strip, and therefore know who is with Hamas and who isn’t. I used to think that the defamation and incitement campaign against the Islamic Resistance Movement (Hamas) was limited to a few Egyptian television stations and specific programmes aired on them, supervised by some icons of the former Hosni Mubarak regime. However, the threats made by Foreign Minister Nabil Fahmi, reported by Al-Hayat newspaper in London, confirm how wrong such a belief is. Such threats should not be made by a minister of a large allied country like Egypt against the small and besieged Palestinian territory. Fahmi used unprecedentedly threatening language for the person leading his country’s diplomatic ministry. He should have left the threats to the generals or security agencies. From what I know of him, like his late father Nabil Fahmi has nothing to do with the army in terms of profession and expertise, but everything to do with patriotism, diplomacy and elegant communication skills. When the minister says that “Egypt’s retaliation will be harsh if it feels Hamas or any other party is trying to harm Egypt’s security”, and, at the same time, points out the “presence of many negative indications”, and hints that “his country’s response would include military and security options”, then it is “a declaration of war”. Such a declaration has not been made against Israel since the October 10, 1973 war, despite all its breaches of international law, the killing of Egyptian soldiers and various violations of Egypt’s sovereignty, so why make one against the Palestinians in Gaza? Egypt’s suffocating security measures against Hamas and the 2 million Palestinians living under its rule in little more than a prison no bigger than 150 square miles have escalated remarkably since the military coup led by Colonel Abdul Fattah Al-Sisi that overthrew the elected president, Mohamed Morsi. Not even a tenth of these measures were applied during the Mubarak era, who was accused of antagonising the Palestinian people and protecting Israel; in saying this I am not acquitting Mubarak but criticising the excessive measures taken by the current authority and condemning some of its actions. Since the July coup, some Egyptian TV stations have opened the doors of media hell against Hamas in particular and the Palestinian people in general. They have aired programmes depicting Hamas as the greatest threat to Egypt and its people; the reason for the military manoeuvres in Sinai; responsible for the queues at petrol stations; behind the shrinking of loaves of bread; and profiting from the increased price of tomatoes and onions. The irony of it all is that all of these largely artificial crises were resolved the day after the coup. The new Egyptian authorities have destroyed all the tunnels and established a one kilometre buffer zone on the border with Gaza. In the process they have destroyed all the homes of the Egyptians living in that area, who were dependent on the illegal tunnel trade. Moreover, the authorities have closed the Rafah border crossing, even for emergency medical cases. They have also prohibited Palestinian fishermen from sailing near Egyptian waters to make their living and feed their children after the Israeli authorities prohibited them from making a living in Gaza’s own territorial waters by means of their oppressive imposition of a 3-mile limit. The Hamas government, which admitted making mistakes in its opposition to the coup that overthrew their Muslim Brotherhood ally President Morsi, has banned mosque Imams from speaking about internal Egyptian affairs or insulting Colonel Al-Sisi. The government in Gaza has also, prohibited any demonstrations in solidarity with the detained president and in opposition to Al-Sisi and the coup-led government. Moreover, some Hamas officials, Ismail Haniyeh and Mousa Abu Marzouk among them, have praised Egypt and its army on television, thanking them for their grace towards the Palestinian people. All that was left was for them to kiss their hands and bow in gratitude, asking for forgiveness, but they did not receive any; instead the measures against them have become more stringent and arbitrary. I certainly do not deny that Hamas supported President Morsi and over-sympathised with the protests in Rabaa Al-Adawiyya Square. It also showed hostility towards the Egyptian army, which was expressed overtly on television channels loyal to the movement. This was expected for two reasons: first, because Hamas is an extension of the Muslim Brotherhood movement in Palestine, and secondly because tens of millions of Egyptians sympathise with the Brotherhood, voted for their candidates in the parliamentary and presidential elections, and put President Morsi in office. Moreover, we are well aware that the Egyptian army is engaged in a fierce war in the Sinai against rebel jihadist groups that established a state within a state, and that some of these groups were behind the violent operations that targeted members of the army and security agencies. I also understand that there are accusations of a link between these groups and some of their counterparts in the Gaza Strip. However, Hamas has adamantly denied the accusations of collaborating with these groups and expressed its willingness to coordinate with the Egyptian army to counter the security threats. The Egyptian intelligence agencies know each one of the people of the Gaza Strip, whether they are inside or outside the Strip, and therefore know who is with Hamas and who isn’t. As such, why are they humiliating all Palestinians at Egypt’s airports, where they can be held for hours, even days, before being sent back from whence they came? Why would they close the Rafah crossing in such a way that makes the lives of the ill and needy hellish; not all Palestinians are supporters of Hamas but they are all being punished. It is claimed that Hamas, indeed the Palestinians in the Gaza Strip, want to seize Sinai and settle thousands or people there. It has also been said that Hamas stormed prisons in order to free President Morsi and his friends, and that some of its members guarded the Federal Palace when it was surrounded by protestors, as if Egypt were a banana republic and does not have a central security unit of over one million soldiers. This is an insult to Egypt before it is an accusation against Hamas, as well as an exaggeration of its role and capabilities. When President Yasser Arafat was shown the plans to build Gaza Airport, he noticed that the architects put the terminal building within the Gaza Strip but the runway extended a dozen metres or so across the border into Egyptian territory. He protested strongly and demanded that it be changed so as not to upset his Egyptian brothers. He understood Egyptian sensitivity about their land and sovereignty, a virtue which I envy. I am at the head of those who demand Egypt’s right to national security; the security and stability of Egypt is the hope of every Arab because it means the security and safety of all Arabs. However, at the same time, I would like our Egyptian brothers, both in the government and the media, to have mercy on the Gaza Strip and its people and not insult and besiege them. The territory is an extension of Egypt, its people and Arabism, to the extent that it rejoices in Egyptian victories on the football pitch as much as, if not more than, Egyptians themselves. It would be no great honour for Egyptian tanks and US-made F-16 fighters to bomb Hamas targets in the Gaza Strip. Honourable people in Egypt should, therefore, act quickly to contain this crisis as Egypt has been and will remain the mother of all Arabs and the defender of their national causes as well as their legitimate rights, beginning with the Palestinians and their rights. (Reuters) – Egypt’s second biggest Islamist party, Nour, on Friday rejected proposed changes to the constitution that would outlaw parties founded on religious grounds, and called the move a “sword drawn” against Islamists. The proposal, made during meetings of the constitutional committee this week but not yet formally approved, came days after a Cairo court separately banned the Muslim Brotherhood, Egypt’s dominant Islamist force. “It’s wrong to blame the whole Islamist current for the mistakes of the Muslim Brotherhood,” said Nour Party head Younes Makhyoun in a statement. “We reject this article completely because it is discriminatory and exclusionary. Islamist political parties formed after the downfall of veteran autocrat Hosni Mubarak in 2011 dominated elections, and the Brotherhood’s Mohamed Mursi became Egypt’s first freely elected president. But after a year in power, huge demonstrations against his rule prompted the army to oust him. Security forces have launched a crackdown on the Brotherhood in which hundreds of Islamists were shot dead on the streets of Cairo and thousands more, including Mursi, arrested. Any move to ban religious parties would redraw Egypt’s political map and turn the clock back to the days under Mubarak when Islamists were not allowed to form political parties. Nour, founded shortly after the popular uprising against Mubarak, backed Mursi’s overthrow in July by signing up to a road map for Egypt’s political transition that included amending the constitution and setting a time frame for new elections. But earlier this month, Nour, whose representative is one of only two Islamists on the 50-member constitutional committee, walked out of a meeting to protest against moves to curb the influence of Islam in state affairs. Moves to outlaw Islamist movements and parties have raised fears in Egypt that supporters who see little hope for a democratic future may resort to violence. Militant groups have long been active in the Sinai Peninsula bordering Israel and the Palestinian Gaza Strip, a region where central authority is weak and attacks on security forces have spiked since Mursi’s ouster. 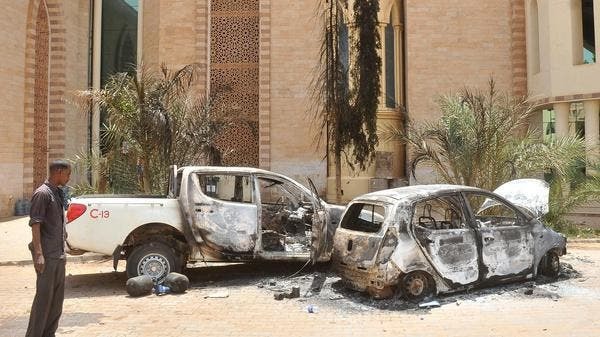 More than 100 members of the security forces have been killed in Sinai since the overthrow, and on Friday a policeman was shot dead by gunmen in the city of El-Arish in the north of the region, state television reported. In a separate incident in Sinai, an armored personnel carrier was hit by an improvised bomb on a road near Sheikh Zuweid which injured one soldier and triggered shooting in which one man died, according to state news agency MENA. MENA also said two explosive devices detonated near police check points on the outskirts of Cairo, wounding two policemen. And in Alexandria, several hundred pro-Mursi protesters took to the streets and clashed with residents, leaving at least five injured with birdshot and gunshot wounds, medical sources said. Fatah’s military wing, the Al-Aqsa Brigades, has claimed that former leader Mohammed Dahlan is planning to topple both Palestinian Authority President Mahmoud Abbas in the West Bank and the Palestinian government in the Gaza Strip. In addition, the statement says that Dahlan, who is currently living in the UAE, is to form a leadership brigade to take over the security services and government offices once the implementation of the plan has started. Dahlan’s affiliates, the statement claims, are to start making preparations for the plan by scanning the opinions of members of the security services towards the dismissed leader, assessing whether or not they would agree to his return. According to the plan, there would be two starting points: one in Al-Areesh and the other in Jordan. The implementation of the plan would be accompanied by a tightening of the siege on Gaza by Israel and Egypt, including a military operation starting in the south of Gaza and ending in the north. Regarding what to do with Abbas, the statement indicates that he is going to start an international tour soon, thus during this time the revolution would start and the rebels would then ask for him not to return home. At the same time, Dahlan’s affiliates would have control of Palestine TV and start broadcasting national songs, waiting for a revolutionary statement. By the end of the plan, Dahlan would have full control of the security services and government offices, and announce an emergency government headed by him. In response to this plan, Al-Aqsa Brigades has called for the leadership in Egypt and other Arab countries to officially deal only with Abbas and his authorities in the West Bank, as well as to stop supporting Dahlan’s coup plans. CAIRO (AFP) — Egyptian prosecutors have extended the detention of an Al-Jazeera journalist for another 45 days, his lawyer said Thursday, amid accusations of a crackdown on the channel for pro-Islamist reporting. Abdallah Elshami, an Egyptian citizen, was arrested on Aug. 14 along with about 700 protesters when police and soldiers dispersed two Islamist protest camps in Cairo, sparking clashes that killed hundreds of protesters. “The decision to extend the detention of 665 people arrested in Rabaa came last night,” his lawyer Mostafa Attiya told AFP. Tunisian students flash the sign of victory during a protest outside Hammamet courthouse to ask for the release of rapper Ahmed Ben Ahmed, also known as Klay BBJ, on Sept. 26, 2013. As thousands of Tunisians around the country took to the streets on Thursday to demand the ouster of the Islamist-led government, a rapper was curtly sentenced to six months in prison amid the country’s growing pains as a new democracy. Tunisian rapper Klay BBJ was jailed for songs deemed insulting by the authorities. The verdict, which his supporters slammed as a sign of the government’s growing intolerance, was delivered after a 90-minute trial. Klay BBJ, whose real name is Ahmed Ben Ahmed, said during the hearing that he was being tried for criticizing the government, led by the Ennahda party, which is frequently accused of trying to stifle the freedom of expression Tunisians fought for in the 2011 revolution. “Our songs criticize the current situation in Tunisia and the government, no more and no less. I am among the rappers most critical of the government and that is why (the authorities) are after me,” he told the judge. His lawyer, Ghazi Mrabet, said he would appeal the verdict. “It is a new injustice targeting artists. I will appeal and continue the fight,” Mrabet told AFP. Klay BBJ was on trial for defamation, insulting officials and undermining public morals in songs he sang alongside fellow rapper Weld El 15 at a concert last month in the eastern town of Hammamet, where Thursday’s trial took place. The two men were given 21-month jail terms in absentia at the end of August, without being summoned to court or even informed of the trial. While Klay BBJ decided to contest the earlier ruling, Weld El 15, who has been on the run since his conviction, has alleged judicial harassment and said he does not plan to appeal. Weld El 15, whose real name is Ala Yaacoubi, was jailed in June for a controversial song he wrote called “The Police are Dogs.” The song targeted alleged police brutality in Tunisia. Increasingly, artists like the two rappers are paying a high price for picking fights with the authorities. Arezki Daoud, editor of The North Africa Journal, said two powerful currents – conservatives who by and large support Ennahda and their liberal opposition – are clashing in a nation that is still redefining itself after ousting the regime of Zine El Abidine Ben Ali. With so much uncertainty over how Tunisia will be governed, the nation is in flux. “There is no clear constitution, no blueprint for the laws that the country is going to adopt, that’s why you see so much fighting and feuds,” Daoud said. “And that’s translated to the jailing of artists and musicians,” who often vocalize the opposition perspective. Daoud said it is important to note that Ennahda was democratically elected less than two years ago, and that many people still support the Islamist-led ruling coalition. That means a prolonged political battle between Tunisia’s conservatives and liberals is likely in store. Supporters of Klay BBJ condemned Thursday’s ruling, saying it was proof that the authorities were determined to suppress freedom of expression. “This is just a political trial. It’s a scandal to put an artist in prison for his songs. It’s another step towards the establishment of a new dictatorship in this country,” said Thameur Mekki, who runs a support group for musicians pursued by the authorities. “They want to humiliate us one by one, to crush all our hopes. I fear for our country,” said Mohamed Amine Hamzaoui, another Tunisian rapper, visibly emotional after Thursday’s ruling. Rights groups say the draconian penal code inherited from the regime of Ben Ali, which is still in force, is used extensively to stifle criticism. The assassinations of two high-profile opposition leaders in six months incurred violent, widespread outrage and calls for the government’s resignation in July, and recent trials of musicians and journalists have sparked a second wave of criticism directed primarily at the police and judiciary. Tunisia is not the only country in the Arab world to witness a crackdown on free speech and individual rights by conservative rulers. But Arezki Daoud pointed said Tunisian activism is exceptional, and that has made the North African nation a flashpoint for post-Arab Spring tensions. “The thing about Tunisia is that there is a very vibrant liberal wing of people who are pro-free speech, pro-women’s rights, that are fighting back, and that’s adding to the tension,” he said. The family of the patient prisoner Abdul-Jabbar Shemali, 34, from Araba village in Jenin, called on human rights organizations and Doctors Without Borders to intervene to save their son’s life. The patient prisoner’s family has told Ahrar center that their son suffers severe back pain and needs an urgent surgery which the Israel Prison Service (IPS) refused to carry out. He suffers from severe hoarseness that led to losing his ability to speak, the family added, warning of serious deterioration in his health. Fuad al-Khuffash, the director of the center, confirmed that Shemali was in good health condition before his arrest, however due to the Israeli difficult detention conditions he started suffering many health problems and illness. Nearly 30 Palestinian patient prisoners are currently detained in Eichel prison including three cancer patients suffering severe health deterioration due to the Israeli deliberate medical negligence. The prisoner Shemali was arrested in June 2001 where he was sentenced to 27 years on charges of carrying out a “subversive operation”. Secretary of State John Kerry may be negotiating an end to Syria’s chemical weapons program, but the country I worked so hard to document is already gone. Since 2006, I’ve traveled to Syria to photograph and record the nation’s ancient Christian, Muslim and Jewish communities for Smithsonian Folkways, the Sephardic Heritage Museum and the Yale Institute of Sacred Music. I have dealt with every part of Syrian society: religious leaders, Kurdish villagers, President Bashar al-Assad’s secret police, underground death-metal bands, restaurateurs, artists and professors. Today, many I know have fled. Some remain as a matter of pride, but most because they don’t have the means to escape. The archbishop who first hosted me has been abducted by terrorists. I have friends fighting on both sides, and many of the streets I spent so much time in are reduced to rubble. All I have left are my photographs. Here are some of my images of Syria, paired with more recent photos of these places’ tragic destruction. I first went to Aleppo’s Saadallah al-Jabri Square when the city was declared a “capital of Islamic culture” by the Islamic Educational, Scientific and Cultural Organization in 2006. Thousands packed the square, dancing in the heart of their 8,000-year-old metropolis. In 2010, on a less happy occasion, I met with a member of the secret police at the now-destroyed Tourism Hotel (in 2010 photo, the last building on right) to get permission to photograph highly protected Jewish cemeteries. The agent was more interested in procuring American skin cream than in my assignment, and I didn’t get approval. Aleppo’s Citadel was the most-visited tourist site in Syria before the civil war erupted — I have the icon tattooed on my arm. Since my last visit, the Citadel’s stone stairs and 1,100-year-old iron door have been heavily damaged, and plans to build a museum and a protective shelter over a 5,000-year-oldtemple inside have been suspended. I befriended an architect working to restore the site. He’s since fled the country and lives in the United States. Built more than 1,000 years ago, Aleppo’s Great Mosque was burned last October, then shelled until its minaret collapsed in April. Like the cathedrals of Europe, the mosque demanded reverence. Its huge open courtyard was lined with archways that harbored the poor and disabled. I spent hours there recording and listening to the blind sing, and photographing the faithful. Mahmandar Mosque, damaged by shelling in 2012, sits in ruin at the edge of Bashita, once one of Aleppo’s most prominent neighborhoods. I spent a great deal of time here, working at the Great Synagogue nearby. Even before the civil war, the neighborhood felt ancient, dusty and forgotten, and I never saw another Westerner. Just outside the mosque was a bakery that made great falafel and manakeesh — small street pizzas coated in olive oil, za’atar and Aleppo pepper rolled on top of each other. I would weave my way through narrow passageways, grab lunch and eat in the mosque’s 700-year-old shadow. A man looks at burnt vehicles on Sept. 26, 2013 in the Sudanese capital Khartoum after rioting erupted following a decision of the government to scrap fuel subsidies. What began early this week in Sudan as a protest against the removal of fuel subsidies has developed into a full-blown uprising that is threatening President Omar Hassan al-Bashir’s 24-year rule. Fuel prices, which President Bashir said they reached “a level that is dangerous for the economy,” soared on Monday after a decision to scrap subsidies went into force. The first protests were staged Monday in Gezira state south of Khartoum. Following the first death, unrest spread to Nyala, the capital of South Darfur state. On Wednesday protests reached the capital Khartoum and its twin city Omdurman, with angry protesters attacking petrol stations and clashing with security forces. The building of Bashir’s ruling National Congress Party was set on fire. The government responded with a heavy hand, deploying thousands of security forces to suppress protests, shutting down the Internet and media outlets and closing schools. Human rights activists said security forces have shot dead at least 50 people since Monday, while police and medical source reported that only 29 have died. The violent crackdown prompted even bigger rallies on Friday throughout the country, with protesters openly demanding the overthrow of President Bashir’s regime. Mariam Sadiq, a senior member of the opposition Umma Party, told Al Arabiya that what is happening in Sudan is a “popular revolution that will only become bigger,” accusing “militias of the ruling party” of deliberately opening fire at protesters. Makki al-Maghribi, a political analyst based in Khartoum, however, said the protests are unlikely to evolve into a serious revolution that can overthrow Bashir’s regime, citing opposition political parties’ engagement in dialogue with Bashir’s ruling party. “The path followed by Sudan now is not the path of a revolution, it is a path of dialogue between the government and the opposition,” he told Al Arabiya. Other political observers, however, downplay the political parties’ influence on the young people movements, which they say are driven by similar ideals of youth movements in Tunisia, Egyptian and Yemen. In Sudan more than 50 percent of the population is younger than 15 years of age and the official unemployment rate is about 20 percent. Economic hardships facing a predominantly younger population, coupled with restricted political participation, provide enough reason for the youth to continue demonstrating, according to experts. “Even if the crackdown succeeds to quell protests now, they will appear again soon in the future because the underlying problems of corruption and injustice are likely to continue amid the regime’s inability to reform itself,” Sudanese writer and political al-Hajj Warraq said. Warraq said the young people leading protests operate outside the orbit of the traditional opposition political parties. “The country was in “a political and economic congestion; the explosion has been long overdue. What is happening now is bigger than any opposition political party,” he said. The military coup that brought Bashir into power in 1989 led to “wrong political and economic practices in which $80 billion of funds were squandered,” al-Mahdi who occupied several ministerial positions before Bashir took power in 1989 reported. Sudan’s external debt was estimated at $41 billion in 2012, growing by 27 percent in four years due to the drop in revenues needed to service it. State revenues in 2012 were estimated at less than $4 billion, while expenditures were valued at more than $7 billion. About 46 percent of the 34 million in population is under poverty line, according to U.N. estimates. Sudan’s ability to continue subsidizing fuel and basic commodities was hard-hit when South Sudan seceded in 2011 taking away more than 70 percent of oil revenues needed for food imports, driving the inflation rate up to an estimated 40 percent. In Jerusalem today, Israeli occupation forces banned Muslim men under fifty years old from reaching the Al-Aqsa mosque and attacked worshipers with tear gas and stun grenades. In besieged Gaza, meanwhile, Palestinians marched toward the Nahal Oz siege gate on the territory’s eastern boundary with present-day Israel to show support for Al-Aqsa, which is increasingly under assault from Jewish settlers. Gaza students Belal Dabour and Asem Alnabeh were present and offered live accounts via Twitter. 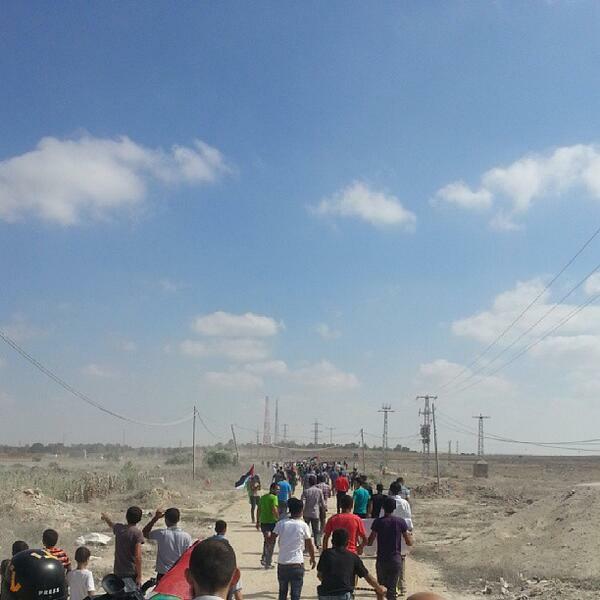 Alnabeh tweeted that marchers set off toward Nahal Oz from three locations in Gaza. The day’s events as witnessed by Dabour and Alnabeh began when hundreds of people gathered in central Gaza City to march toward the Nahal Oz crossing with Israel east of Gaza City, according to Dabour. As the marchers headed east thorough the Shujaiya section of Gaza City, more people joined the march, Alnabeh tweeted. As the group reached the Nahal Oz crossing, Israeli army jeeps gathered on the other side. 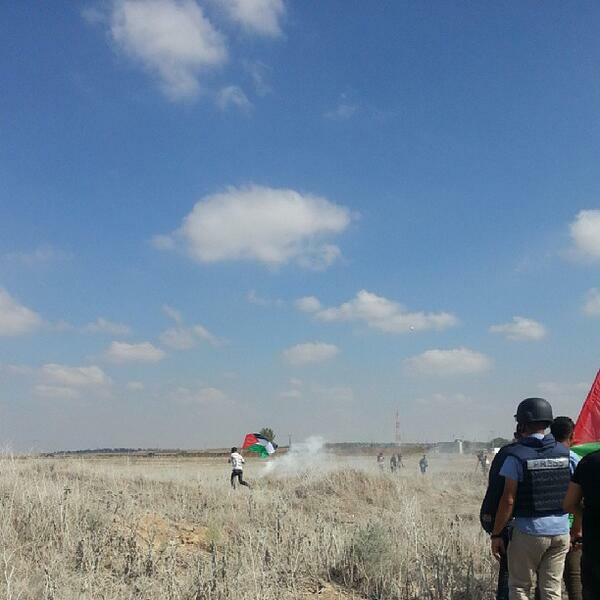 Palestinians youths threw stones toward the occupation forces, who fired shots into the air and fired tear gas grenades at the marchers, according to Alnabeh. One young man, pictured by Alnabeh, tried throw one of the gas grenades back, in a scene reminiscent of the weekly protests in West Bank villages such as Bilin and Nabi Saleh. The gas caused some people to faint, Dabour tweeted. A photo Dabour tweeted shows a young man being treated for gas inhalation. The video at the top of this post shows one injured person being carried away. Despite thick clouds of tear gas, the marchers were undeterred from their goal of reaching the border. According to Dabour, hundreds of people entered the so-called buffer zone, territory in Gaza that Israel has unilaterally forbidden Palestinians from entering. 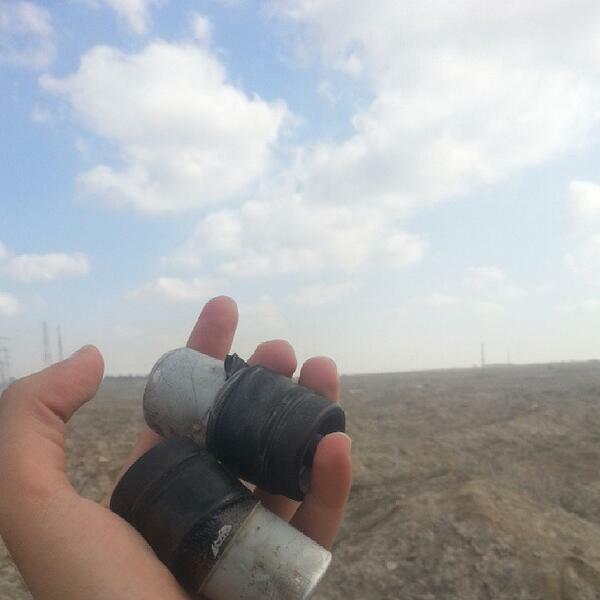 Alnabeh said that Israelis fired munitions that set fire to fields in the area. 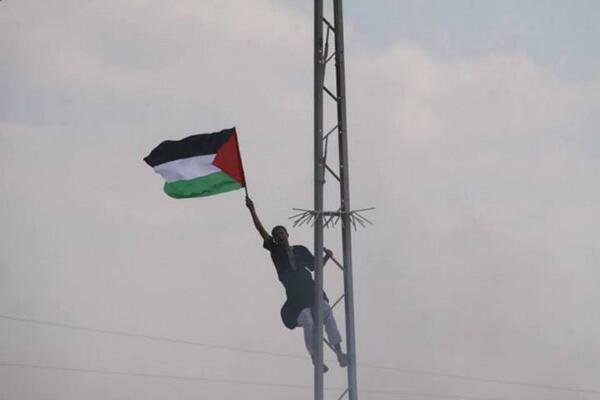 One young man managed to raise a Palestinian flag on a pylon, in view of the occupation forces. Alnabeh and Dabour returned home safely. Israel’s housing minister, Uri Ariel, has claimed that the state’s borders “extend from the Jordan River to the western border”, which is, of course, the Mediterranean Sea. He told an Israeli news channel that he rejects the establishment of another state “based on the 1967 borders”. This, along with Israel’s colonial-settlement policy is entirely consistent with “the teachings of the Torah” he believes. The extreme right-wing minister was speaking at the opening of a synagogue on an illegal Israeli settlement-colony in the occupied West Bank. “You are the good people who represent the Torah,” he told the settlers. This statement is just one of many racist and extreme statements made by Uri Ariel; he said recently that a Jewish temple should be built in place of Al-Aqsa Mosque, and that the establishment of a Palestinian state is just “a myth”. Moreover, during a press conference the Israeli Minister held at the Shilo colony in the occupied West Bank, he said that the Israelis have built many temples, but they need to build what he called “the real temple on Temple Mount”, which was a reference to the Noble Sanctuary of Al-Aqsa, wherein stands Al-Aqsa Mosque and the Dome of the Rock. Commenting on Ariel’s statement about the state of Israel extending from the river to the sea, the Arab Deputy Speaker of the Israeli parliament, the Knesset, said that it indicates that extremism and racism are now part of the mainstream in public life. Dr Ahmad Tibi, who is also the leader of the Arab Movement for Renewal, described both characteristics as going against all legal norms and agreements. “Extremism exists at the very top of the political pyramid in Israel,” he added. In a related context, Naftali Bennett, the leader of the Jewish Home Party and Israeli Minister of the Economy, expressed his belief that the establishment of a Palestinian state west of the Jordan River will cause Israel “100 years of continuous war, will flood the Jewish state with millions of Palestinian refugees, and will increase international isolation”. Moreover, Bennett posted on his Facebook page that he believe that such a Palestinian state will be poor and hostile, “such as the state established in Gaza in 2005”, the actions of which are still “hostile and extremely dangerous”. Such a state, he said, will be a 30-second flight from Ben-Gurion International Airport and 10 minutes away from the city of Petah Tikva, located in the centre of the self-styled Jewish state. Bennett went on to say that Israel’s unilateral withdrawal from Gaza in August 2005 gave the state “thousands of missiles and a terrorist state run by Hamas”. He also wrote that the two-state solution Prime Minister Netanyahu said he was committed to in his speech at Bar-Ilan University is not applicable and, therefore, “an alternative to planting a Palestinian state in the heart of Israel must be found”. Nevertheless, his party will not prevent or oppose any negotiations with the Palestinians despite its lack of faith in them. Furthermore, he called on the majority of the Likud members of Knesset to sabotage the negotiations with the Palestinian Authority, noting that Israel is making concessions that go against the principles of the Likud Party during the rounds of talks with the Palestinian Authority. Bennett called on 7 of the 11 Likud MKs to stop negotiations; subsequently, the members sent a letter to the Deputy Speaker of the Knesset, Danny Danon, who is also Deputy Minister of Defence, urging him to hold a meeting for Likud Party members. According to Yedioth Ahronoth newspaper, the members told Danon that the Israeli government headed by Likud is engaging in political negotiations which include Israel’s agreement to a list of concessions that clash with the party’s principles mentioned in its charter. The letter also mentioned the demand that Likud MKs be allowed to express their initial positions on these matters in the Knesset. It is worth noting that Danon has now called for the immediate cancellation of the Oslo Accords, the announcement that the agreement has failed, and the acknowledgement that it was a mistake. He is on record of telling the New York Times that 20 years down the line from Oslo the Israelis and Palestinians are still in negotiations. “True peace seems far away,” he insisted, “just as it was before the disclosure of the secret talks in Oslo.” The Israeli government, stressed Danon, must put an end to this “foolishness” immediately. In this, we must agree with Danon, for the evidence from the mouths of senior Israeli politicians is clear; peace looks less likely than ever before and the Israeli colonisation of Palestinian land is increasing daily. A Zionist state from the river to the sea is already a near-reality because of Israel’s illegal settlements and military occupation, and the government is insisting that a “final” agreement with the Palestinians would insist on keeping Israeli soldiers based in the Jordan Valley. Israel’s racism and extremism, when coupled with its expansionism, look set to make sure that a truly viable Palestinian state on the 1967 borders is just never going to happen.